When her father assassinates Henry Carson, his employer's son and Mary's admirer, suspicion falls on Mary's second admirer, Jem, a fellow worker. Mary has to prove her lover's innocence without incriminating her own father. Persuasion, Jane Austen's last novel, is a tale of love and marriage told with irony and insight. Anne Elliot and Captain Wentworth have met and seperated years before. Their reunion, after the passage or irrecoverable years of their youth, forces a recognition of the false values that drove them apart. Really lovely . . .
Having sold millions of copies in print, Bernard Evslin’s classic retelling of the Greek myths captures the excitement and enchantment of these stories that have influenced many of today’s popular films and novels. Easy to understand and fun to read for both adults and children, it is no wonder this book has been taught in schools all over the world. When Mary Lennox's parents die from cholera in India, the spoiled orphan is transplanted to her uncle's 600-year-old gloomy and secretive estate in England. She is certain that she is destined for misery at Misselthwaite Manor. However, she soon discovers an arched doorway into an overgrown garden, locked shut since the death of her aunt 10 years earlier. Absolutely. This book was first written as a monthly serial over 20 months. Twenty episodes for 20 days perhaps. Or, if you are like me, you'll forgo sleep and listen to all. Then listen again, several times over, to catch the parts missed whilst dozing the first few times. Dickens writing is meant to be spoken. Hilarious characters beautifully exaggerated - or are they - abound here. The most decent of characters. And the most vile. My greatest reason for recommending this book is that the two readers really demonstrate Dickens intent when he gave Bleak House two narrators, the unknown onlooker telling in the present tense; and Esther, around whom all of the stories are woven. Poverty, wealth, class systems, skullduggery, robbery and murder are all given centre stage. Personalities galore. Lady Dedlock is perhaps the most intriguing to me. I don't understand her loyalty to her awful husband, Sir Leicester Dedlock. Perhaps it's gratitude that he married her despite her past, though he knows nothing of it. She's awful. She's snooty. She's breakable. She's smart. She's discerning. She's drawn to beauty. She's conceited. Her husband is quite a bit older and very wealthy. Her deceit is so complete that she believes it herself. Most of the time. An occasional sensitivity is revealed. Which character – as performed by Sean Barrett and Teresa Gallagher – was your favorite? Narrator Sean Barrett is witness to the events that run almost parallel to Esther's own memoir. Both readers were called upon to animate, and maintain, the voices of a huge variety of characters. Sometimes the voices are whining and irritating. Sometimes, seductive and warm. As are the characters. I particularly enjoyed Teresa Gallagher's interactions between Esther and Charley, the thirteen year old orphan girl who leaves her six year old brother Tom to take care of their baby sister while she goes to work as a laundress and is later employed by Mr Jarndyce to be Esther's maid. Her portrayal of Esther's voice throughout is easy and confident, warm and chatty at times. Formal at other times. Thoroughly enjoyable. Sean Barrett's dialogues between Lady Dedlock and Mr Tulkinghorn, given the opposing attitudes of the adversaries and the undercurrent of intent, are excellent spoken civilly in a respectably soft volume. But it is Sean Barrett's own voice as the narrator that is most commanding. Many hours of thoroughly enjoyable listening. I am delighted to now be enjoying the narrations from the talented multi voiced Sean Barrett and sweetly nuanced Teresa Gallagher for a wonderful book from Charles Dickens. 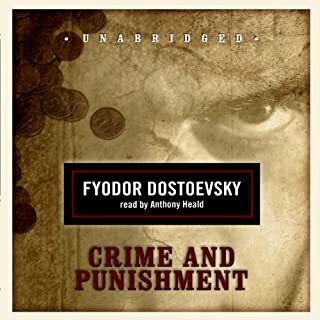 For American ears, I believe this edition is the best from Audible when you are planning to spend approximately 40 hours listening to a hefty classic on the 19th century Bristish legal system -- a "dry" subject in anyone's hands but Dickens. 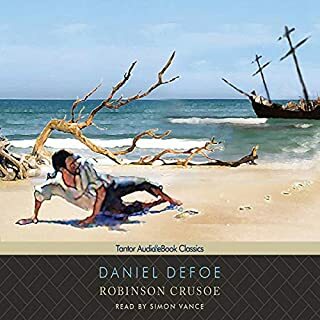 After real difficulty understanding the meaning, even for 4-5 star rated editions and with text in hand, I asked Audible for the first time in 10 years to delete purchased editions from my Library for BLEAK HOUSE because the affected accents interferred with listening. I am so glad I pursued it until finding these two talented narrators - as you will be. This is one of Dickens' more meandering books, but the narration was truly remarkable and made this a great "read". Would you listen to Bleak House again? Why? I highly recommend this book. I don't repeat listening to audio books, but this doesn't reflect on my total satisfaction with this story. I have been on a Dickens blitz lately listening to 8 Dickens' novels and Bleak House ranks among the best. The essential problem is that Dickens has so many rich characters that it is impossible to choose one. Do I pick the novel's heroine, Esther Summerson or the friendly John Jarndyce? Is it Dr. Woodcourt or George Rouncewell? That's the point about Dickens - there are too many great characters to choose from. If I must choose it would be Esther. I like Dickens' female characters (e.g. Florence in Dombey & Son). She is among the best - strong in adversity, faithful to her beliefs, committed to those dear to her and high minded in her actions. And she is charming. George Rouncewell by Sean Barrett and Esther by Teresa Gallagher. I enjoyed both narrators, but I must add that a male narrator does a better job on female characters than a female narrator does on male characters, if that makes sense. Ms Gallagher is fine as Esther but not so with male characters. As in all Dickens' novels, there are high moments of laughter and sadness. Bleak House has sub-plots and minor themes, but the primary focus is Dickens' criticism of the British judiciary system, notably the Court of the Chancery. What is quite revealing and despairing is that the judicial systems of today have not changed that much; there is a law for the rich and another for the poor. The use of dual narration is particularly satisfying in this long, complex but thoroughly satisfying book as I read through the entire series of Dickens novels. I particularly looked forward to Teresa Gallagher's clear, compelling well flowing narration. While Sean Barrett clearly differentiated his characters, following the presumably authentic accents of some characters was a real challenge in some chapters. That is as much a function of my U.S. English-trained ear than the narration, although I would have wished for a bit of compromise on the authenticity in the interest of clarity in a few cases. 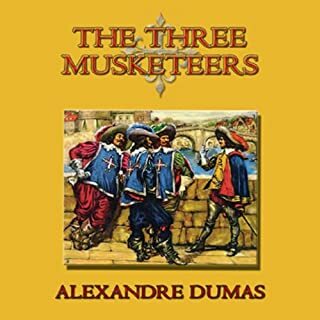 Both narrators appropriately and helpfully understated the melodrama that is rampant in the plot, typical of novels of the era. On a technical note, it would be useful if Audible would list Chapter numbers on the MP3 printed menus to help us find our place. At first the thought of reading a criticism of the legal system in England in the mid 1800s sounds bleak indeed. I was taken by both of the narrators immediately. Teresa Gallagher made Esther's narrative lively, and Sean Barrett as the omnicient narrative did the same. As with many Dickens novels, "Bleak House" is full of fabulous characters (major and minor), dialogue and a story that twists and turns to its conclusion. Expect a range of emotion, happiness, gratitude, shame and grief. Dickens' stories are classic and timeless. I am quite partial to Simon Vance's narrations of Dickens, so I hesitated on buying anything other than his. I was convinced by the reviews and am very glad I chose this version. Both narrators are marvelous, especially Teresa Gallagher. It's a great story and a heartbreaking indictment of the British legal system in Dickens's time; this may make it sound dull, which it is not in the least. 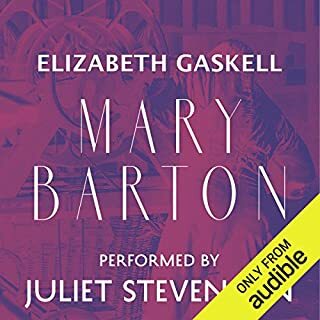 I recommend listening to this and watching the PBS "Bleak House" production from 2005 (with Anna Maxwell Martin, and available on Netflix streaming). It allows you to absorb the story on several levels. I was sorry when the whole experience was over! I am actually listening to it again and again, sampling some of my favorite chapters. Now that I understand the plot and the story, it is a thrill to go back and see how carefully strands were woven together and how masterly the descriptions and social commentary. I had many favorite characters, among them, Guppy, Krook, and George. Have you listened to any of Sean Barrett and Teresa Gallagher ’s other performances before? How does this one compare? This is my first one. I'd like to hear more. I wanted it to last as long as possible, so I lingered.. but it was gripping and a real "page turner". I'm going to get more Dickens! Fantastic reading of an amazing classic! What did you love best about Bleak House? Bleak House is a wonderful book, full of some of the most vibrant characters and subplots anywhere. These readers bring it to life and make it easy to follow and fun to listen to. A joy from beginning to end! 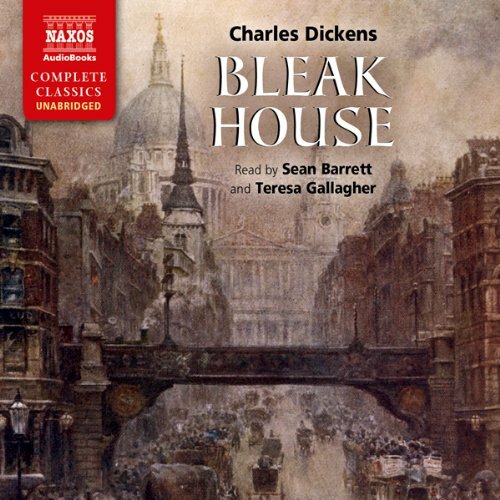 Where does Bleak House rank among all the audiobooks you’ve listened to so far? Bleak House is one of the best and most complex audiobooks I have listened to so far. Dickens is in top form here. What other book might you compare Bleak House to and why? Inspector Bucket is the first investigator in English literature. He cast a long shadow over Sherlock Holmes and other detectives that followed in his wake. I thrilled at his juicy dialogue and keen intellect. He made the later half of the book. The only extreme reaction I had was over how good it was. I kept saying, "I can't believe Dickens wrote that." His writing reached its peak in this book. A long book, but well worth it. I can see why critics state that Bleak House is Dickens best book. This is a must read if you hope to appreciate his writings beyond Oliver Twist and David Copperfield. He adds a few twists to this novel and made them work. You will be rewarded if you read this. I was looking for reviews of dickens's work to help me to decide what to listen to. The reviews spoke of how good the narrators are, which was the selling point for me. I could not be more delighted. Seriously, I thought it was going to be hard-going, but Teresa Gallagher in particular has drawn me right in. If you are thinking about this, just don't hesitate. Seriously, I can't recommend it enough. Sean Barrett is never less than brilliant but Teresa Gallagher's performance here needs real praise too. Esther's character and her part of the narrative can seem precious to some, but the way in which Gallagher matches Barret's vigour as a caricaturist and yet keeps us anchored in Esther's world view is a challenge that is much harder to achieve or sustain; Gallagher manages to do both, and you end up realising just how rich and subversive Dickens use of this narrator is. This is the first time I have "read" Dickens, having seen oh so many adaptations, and it was a revelation. I was so surprised by how funny his writing is and all the little touches that truly bring the story and charaters to life. As for this adaptation, it is, quite simply, spellbinding. The use of two narrators really brought the story to life and both were exceptional. I have eulogised about this to my wife who now wants to listen and I would be very happy to listen to this time and again. Brilliant, brilliant, brilliant. Sean Barrett's reading of little Joe's demise had me weeping so much I couldn't listen again until 24 hours had passed! Sean was incredible, Teresa was fine, and Dicken's prose was incomparable! Can't recommend it more highly. I love Dickens however with Bleak House I had struggled to get into it.... but with the amazing voices of Sean Barrett and Teresa Gallaghher I found I was right there...in the foggy streets of London feeling angry with the court system. As usual the Dicken's characters are diverse and vivid. They make you laugh, move you, anger you or inspire you alternately. 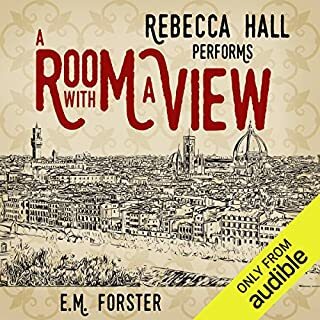 I enjoyed this audiobook so much I'm listening to it again even though I only just finished it....there is so much detail, so much sly humour that I keep finding things I missed the first time around. 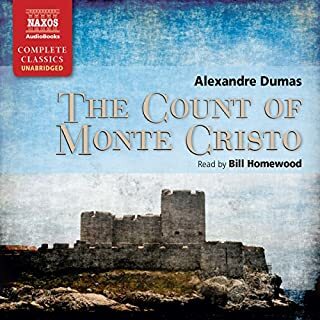 This was my first purchase from audible and it was certainly value for money. Brilliantly read and thoroughly compelling. For any Dickens fan this is well worth a listen. What did you like most about Bleak House? It is a brilliant expose of Victorian social life which touches raw human emotions. What was one of the most memorable moments of Bleak House? Have you listened to any of Sean Barrett and Teresa Gallagher ’s other performances? How does this one compare? A masterpiece of narration. Sean and Teresa complement each other and give added depth to the story. They both excel themselves. The range of voices used by both is amazing, bringing the characters to life. The death of Jo. Sean's reading combined with Dickens's empathetic narration was a very emotional experience which moved me to tears. An outstanding rendition of this monumental drama. High praise to Sean and Teresa! Dickens' ”Bleak House” is perhaps his most celebrated novel, a pioneering work that, if there is talk of the literary canon, usually has a rather prominent place reserved for it. It's full of remarkable writing, among that writing the classic descriptions of London and the fog; it's commended for its structure, and complex array of characters and their interactions. In short, it's a classic, Dickens at his most Dickens. And I'm so glad it's over. This was supposed to be right up my alley: I had read ”David Copperfield” and was completely immersed, as I loved the language, the style, the atmosphere. The narrative is broken into two parts, that of an apparently omniscient narrator and that of Esther, and these two narrative threads ricochet, swerve and intermingle. The first fifty pages are utterly exhilarating in their beauty and poetry, but I wasn't expecting the book ironically to turn into a big, never-ending Jarndyce and Jarndyce with no end in sight: I think the idea, generally, is a very good one, the mystery works, and the social aspect adds a realistic dimension to it all, especially since Dickens had first-hand experience of the legal system. But the main flaw of the book, for me, was that it just dragged too long for its own sake so that what pulse there was had, halfway through, become a mere memory. I wasn't too enthralled by any of the characters, either. I had difficulty with Esther's narrative, especially, where everything happens during the golden hour or the rosy-fingered dawn, or is, in other ways, full of sweetness and dearness, and little else. Since I've only read ”David Copperfield” I'm not really in the position to say, but so far it seems that it's the main character who has the misfortune to be the channel through which all things happen, but who seems to have little to contribute on one's own. I'm surprised that I'd yearn for the classic device of change in the character so much, but I think Esther, and many of the other characters, exist primarily in a stasis, or vacuum, without much gravitational force to pull them either way. The narration has its pros and cons. On one hand, both Barrett and Gallagher do a good job with the material, often emphasizing the caricatures, but on the other, the text itself is so long that it's difficult to carry it through, even with two narrators. It doesn't help that Gallagher has to deal with Esther's narrative, which, as to my complaint, isn't all that interesting and offers very little. I'm trying to make sense of my feelings to myself as much as to you, who might have unhappily stumbled upon this review. One thing that didn't help was that while I listened to ”Bleak House” had another reading project going on, that being Thomas Pynchon's incomparable ”Mason & Dixon”, a work of an equally gifted, or even more gifted, master of the language. In many ways my experience with Pynchon mirrored with ”Bleak House”: when Pynchon was wild fun, Dickens offered surprisingly few moments of glee; while Pynchon was able to weave a complex narrative that moved unpredictably, Dickens' narrative, with its many ”surprises”, felt like it just wandered off into the desert unprepared, stalling and hoping to get out alive. Whether it did, I'm not quite sure. I'm certain, however, to re-evaluate whether I'll have to guts to try ”The Pickwick Papers” anytime soon, as I already have it in my library. I think I'll go somewhere else first. Still a rich and friity story..
As we socially return to 19th century values this story tells of what we can expect. Property, littigation, ruin and pomp. Would you consider the audio edition of Bleak House to be better than the print version? What about Sean Barrett and Teresa Gallagher ’s performance did you like? 35 hours - are you serious? I'm only 5 hours in, but already I'm completely hooked. Sean Barrett and Teresa Gallagher are the perfect readers, exactly the right timbre of voice, excellent at differentiating the characters, and leading you so well through some of Dickens's more florid passages that you never lose the thread. I'm listening on my new Bose noise-cancelling headphones, so there are not outside distractions, and I'm completely lost in it. Another wonderful Dickens story with many themes undergirding a delightful plot. A few dialogue exchanges with secondary characters became lengthy late in the story but overall a beautiful novel and well worth the commitment.